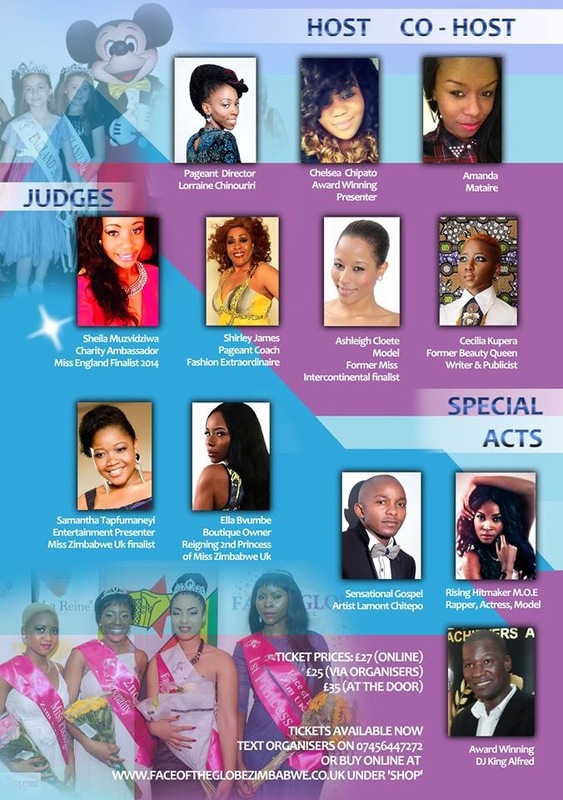 AFTER months of planning with applications across the UK, Zimbabwe and South Africa, the international pageant known for glamour, class and intelligence hits the UK for the 2nd year running on the 24th July 2014. The beauties of Zimbabwean heritage will compete for the crown of Face of the Globe Zimbabwe 2014 at the prestigious, City Rooms in Leicester. Entrepreneur and pageant Director Lorraine Chinouriri said: "Last year was amazing, the support from the Zimbabwean community was so encouraging and our winner, Alishia Musungo went on to compete in Paris with over 18 countries, since her win her modelling career has taken off and she has been the best ambassador for our brand. This year we are crowning 4 winners and taking them all to Paris for a week in October where they will compete on the international stage." Face of the Globe Zimbabwe is the only international pageant that has no weight, or height restrictions, welcomes mothers and takes all it's winners on an all expenses paid trip to Paris to compete on the international stage. Contestants will be judged on their intelligence, charisma, class and commitment to charitable causes, their portrayal of the modern Zimbabwean woman and representation of the beauty of Zimbabwe as a country. The international pageant, which has created an exciting buzz in the media and community, has a vision to reach Zimbabwe in the future. 'We are currently in talks to bring the pageant to Zimbabwe and we want to be able to get finalists in Zimbabwe to fly in to compete in the Uk and then onto Paris. We have had applications in from Zimbabwe and South Africa and as long as finalists can fly into the UK, they are welcome to compete. We have applications coming in as we speak and that is amazing. We love what we do, I have a great team of volunteers from hosts, judges, artists, DJ , makeup artists to hair stylists to a great pageant coach, Shirley James who has been in the industry for over 30 years and none of us get paid it's just the love of the industry and that in itself is fantastic, if our yearly event can fund charitable causes in Zimbabwe on the scale of Miss World, I would be extremely satisfied'. All 4 winners of Face of the Globe Zimbabwe 2014 will win a 7-day ALL EXPENSES paid trip to represent the country at the global finals in Paris, among other prizes. The 4 winners will also win a photoshoot and goodie bags from award winning BLACKARMOOR clothing as well as a chance to win the titles of 'Miss Photogenic' and 'Miss Personality'. The Judges are all former or current beauty Queens; Samantha Tapfumaneyi, Ella Bvumbe, Sheila Muzvidziwa, Cecilia Kupera and pageant coach, Shirley James. 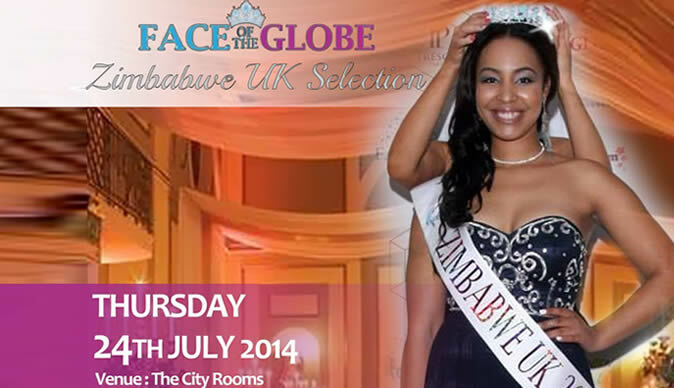 The 'Face of the Globe Zimbabwe' show will be held at the 'The City Rooms, Leicester, LE1 5AW ' on Thursday, July 24th 2014. Event starts at 6pm. Ticket information www.faceoftheglobezimbabwe.co.uk or call 07456447272.